Out of the thirteen Lok Sabha seats in the state, if at all these wife's get tickets then once again the history might repeat. CHANDIGARH: History of sorts could be repeated in Punjab. As this time not one but four celebrity wives could be battling for separate Lok Sabha seats in the coming parliamentary elections. While the former Cricketer and Punjab Local Bodies Minister Navjot Singh Sidhu's wife Navjot Kaur Sidhu is likely to be fielded for Amritsar Lok Sabha seat, former Minister of State for External Affairs Preneet Kaur wife of Punjab Chief Minister Capt. Amarinder Singh would most likely contest from Patiala both from Congress. Union Food Processing Industry Minister Harsimrat Kaur Badal wife of Shiromani Akali Dal President Sukhbir Singh Badal will recontest from Bathinda and Kavita Khanna wife of late Bollywood star and former Member of Parliament Vinod Khanna front runner from Gurdaspur. Out of the thirteen Lok Sabha seats in the state, if at all these wife's get tickets then once again the history might repeat. 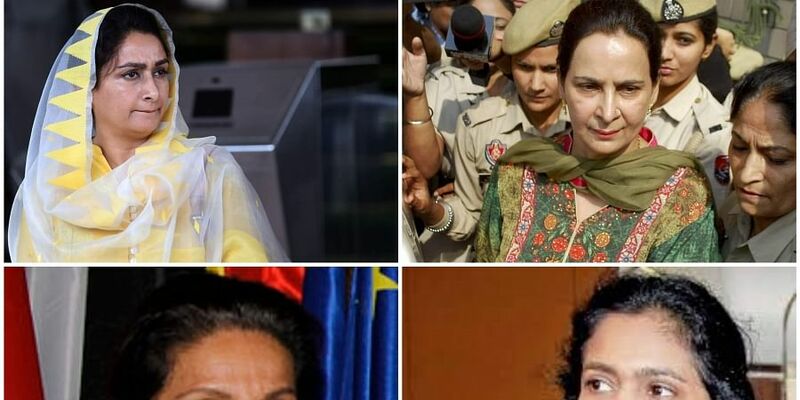 From 2009 to 2014 there were four women MPs from the state, Harsimrat Kaur Badal and Paramjit Kaur Gulshan both of SAD and Preneet Kaur and Santosh Chaudhary of Congress. In the present Lok Sabha, there's only one woman MP from the state. Sources said that Navjot Kaur Sidhu is keen to contest from Amritsar as at present the sitting MP is Gurjeet Singh Aujla of the Congress who is Jat Sikh and might be changed. It is learnt from Patiala the Congress might give a ticket to former Minister of State for External Affairs Preneet Kaur wife of Punjab Chief Minister Capt Amarinder Singh, as in the last general elections in 2014 she lost to AAP candidate Dr Dharam Vira Gandhi. She had won from Patiala thrice in 1999, then in 2004 and again in 2009. While from Bathinda which is considered the backyard of the Badal family, sitting Member of Parliament and Union Food Processing Industry Minister Harsimrat Kaur Badal wife of Shiromani Akali Dal President Sukhbir Singh Badal will recontest she had won this seat in 2009 also. This again the Congress might field Punjab Finance Minister Manpreet Singh Badal against her, in 2014 elections he lost to her. Last but not the least Kavita Khanna wife of late Bollywood star and former Member of Parliament Vinod Khanna front runner from Gurdaspur. Prime Minister Narendra Modi's rally in Gurdaspur on January 3 and his speech changed the BJP's political dynamics in this constituency. Modi's fulsome praise of four-time MP Vinod Khanna in the presence of the latter's wife Kavita has now put her as the front runner and relegated Swaran Salaria to one among the many aspirants. Kavita, who enjoys and backing of several senior leaders, including L K Advani, and also spiritual guru Sri Sri Ravi Shankar.